Honey, along with coconut oil, has to be one of the most universally beneficial natural beauty products. It doesn’t matter what type of skin you have — whether it’s dry, oily, acne-prone, sensitive, inflamed, aging — there’s no one who can’t get better skin with honey. To be clear though, I’m not just talking about any honey. You need to know what you’re shopping for. Most mainstream honey has been pasteurized and ultrafiltered, which means it has been heated to remove any microorganisms and pollutants. However, in this process, many beneficial substances such as vitamins, enzymes, antioxidants, royal jelly, bee pollen and beeswax are also removed or destroyed. When shopping for honey, you want to look for a raw, unpasteurized product. The best honey has been only roughly filtered to remove any major particulates, with the living product otherwise left intact. The thing is, pasteurized honey doesn’t normally have “pasteurized” written on the label because pasteurizing is standard practice for mainstream commercial honey. Anything that says “pure honey,” “real honey” or “100 percent honey” has been pasteurized. If it doesn’t explicitly say “raw” on the package, you don’t want it. What else to look for in a good honey? Ideally, you’ll be able to find raw honey produced in your local area, which is not only more sustainable but can also provide more health benefits by helping your body and immune system adapt to the specific environment you live in. Once you’ve set yourself up with some quality honey, it’s time to get washing! There are so many reasons honey is nature’s divine gift for your face. Humans have intuitively known about the healing abilities of honey, having used it as a food and medicine for thousands of years. Since the 19th century, scientists have been able to analyze how exactly this works. 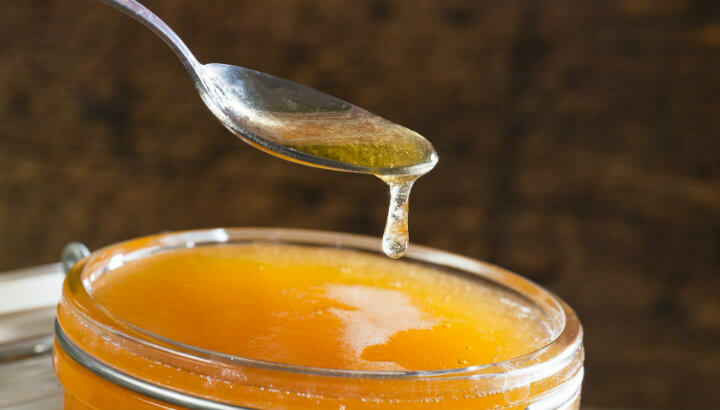 We now understand that honey contains a number of antibacterial factors including a high sugar concentration, low (acidic) pH level, a substance called methylglyoxal, and an antimicrobial peptide called bee defensin-1. Researchers have also found that an enzyme in honey triggers the release of hydrogen peroxide, which is a potent natural antibacterial agent. And honey fights fungus, too. Why is this important for your skin? 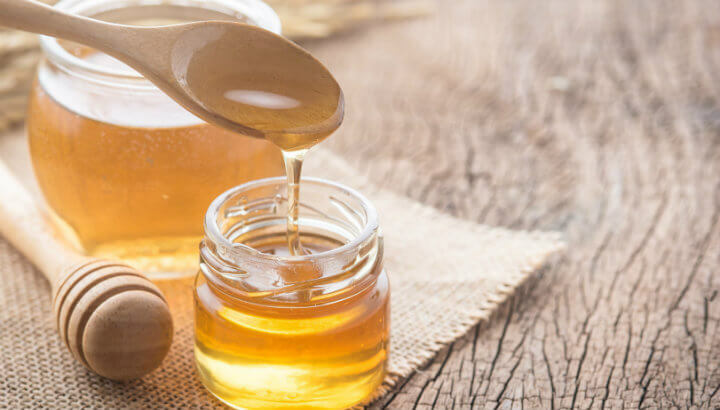 If you suffer from acne, or any fungal or yeast-related skin conditions, honey will help to remove what’s causing the problem without damaging skin, like many commercial face washes or creams might. Even though honey is made up of 80 percent sugar and 18 percent water, the remaining two percent is packed with high-performing compounds. This includes antioxidants like polyphenols, flavonoids and vitamins, which help prevent oxidative damage to cells. While these properties are beneficial when you eat honey, they’re also great when you smear it on your face. Reap the anti-aging benefits of honey! One of the resulting benefits from the antibacterial and antioxidant activity of honey is that any inflammation in the skin can be soothed. If you have any redness or itchy skin, honey is the perfect gentle, moisturizing cleanser. Multiple studies have investigated the anti-cancer activity of honey and honey extracts on cells such as bladder, breast, cervical, prostate and endometrial cancer. A 2012 study specifically examined honey’s ability to protect mouse cells against DNA damage caused by UVB radiation. This can be very helpful for skin, since it is such a vulnerable area for the proliferation of cancer cells, particularly due to environmental factors and sun exposure. If you wash your face (and body!) with honey, any development of cancer cells could be prevented in advance. The many trace vitamins found in honey, along with all of the other beneficial compounds we’ve mentioned above, make it a skin-nurturing powerhouse. This can help keep skin soft and nourished and prevent damage from environmental factors which accelerate the onset of an aged appearance. Add honey to your beauty routine for smooth, clear skin. While honey has been used to support the cleaning, dressing and healing of wounds for centuries, a 2006 literature review collected the scientific evidence to make the benefits of honey incontestable. Basically, honey kills “bad bugs” while retaining the healthy cells of the body and encouraging all of the mechanisms of healing. This makes honey a great face wash not just for preventing acne and other skin issues but also healing any residual damage as quickly as possible, so you can get back to having gorgeous smooth skin. Being a completely natural product, honey clearly wins over all of the commercial facial cleansers which contain things like sulfates, parabens and ocean-polluting microbeads. If you can get just as many (or more) benefits from a non-toxic product made by Mother Nature, why not use it? Honey is known to be an emollient, which means it helps skin retain moisture. This lends that youthful, dewy look that everyone is crazy about. And finally, honey delivers all of these amazing benefits while being gentle on skin — it’s the perfect solution for sensitive, dry or irritated skin. The only precautions are, honey should not be used by infants under one year old, nor those with any bee-related allergies. Ready to get started? First of all, if you have long hair, tie it back out of the way otherwise, it will end up a sticky mess. Next, put a small blob of honey in the palm of your hand, and rub hands together to warm the honey. Massage it all over your face for a minute or two, then rinse with warm water. That’s it! Enjoy your soft, glowing skin. Want more honey ideas? Here are 38 surprising ways to use honey. Hey Buddy!, I found this information for you: "9 Reasons To Start Washing Your Face With Honey". Here is the website link: https://www.thealternativedaily.com/9-reasons-to-start-washing-your-face-with-honey/. Thank you.